The historical events that led to the battle of Karbala where Imam Hussein leading an army of 72 followers from his household and companions go way back to the day Prophet Mohammad passed away, leaving behind a Muslim nation that would divert from the path he charted. Thousands of Muslims then gave Imam Ali an oath of allegiance as the commander of the faithful. This day was decisive in the history of Islam and later became a point of contention between Shiite Muslims and Sunni Muslims. When Prophet Mohammad passed away in 632 AD, dispute broke out over who should succeed him as the leader of Islam. The Shiites maintained that the prophet had already designated Imam Ali as his successor based on the famous speech and Quranic verse. Joining the gathering in Saqīfah Banī Sā’idah, Umar Bin al-Khattab suggested that Abu Bakr be the first caliph and so Imam Ali was stripped of his right only to become the fourth caliph after Abu Bakr, Omar, and Uthman bin Affan. Imam Ali had chosen to concede to avoid a civil war among Muslims but carried on his role as the first of Twelve Imams tasked with continuing propagating the true principles of Islam. Imam Ali had two sons, Imam Hasan and Imam Hussein, whom were called “the masters of the youths of heaven” by Prophet Mohammad. When Ibn Muljam struck Imam Ali with his sword, taking away his precious life Imam Hasan was left to the caliphate. At that time, Muawiya Bin Sufyan engaged in a military conflict with Imam Hasan but then requested a peace treaty to avoid collateral loss. Muslim scholar Al-Hasan al-Basri narrated: “By Allah, Al-Hasan bin Ali led large battalions like mountains against Muawiya. Amr bin Al-As said (to Muawiya), “I surely see battalions which will not turn back before killing their opponents. Immam Hasan agreed to hand Muawiya authority on the condition that he acts according to the Book of Allah and passes it back to Imam Hasan or Imam Hussein after his death. Needless to say Muawyia violated the conditions of the treaty. Imam Hasan was poisoned and martyred. Yazid bin Muawiya occupied the caliphate. Here is where the story of Ashura begun to unfold. When Yazid seized power he ordered the governor of Medina to force Imam Hussein and his followers to pledge their allegiance to him. Aware of Yazid’s corruptness, Imam Hussein refused. The people of the city of Kufa pledged support for Imam Hussein against the Ummayads so he sent his trustworthy cousin Muslim Bin Aqeel to investigate the claims. At first, he found support in the city estimated at more than 20,000 by Ibn A’tham and Khwarazmi, but after Ubayd Allah bin Ziyad was appointed governor of Kufa, Muslim was killed and the people of Kufah took back their word. When Imam Hussein discovered this, he was already on his way to Kufah with his family and companions. The most reliable account quoted by Abu Mikhnaf from Dahhak bin Abd Allah Mashriqi says there were 72 fighters in the camp of Imam Hussein: 32 cavalry and 40 infantry. Betrayed and alone, Imam Hussein reached a land called Karbala. 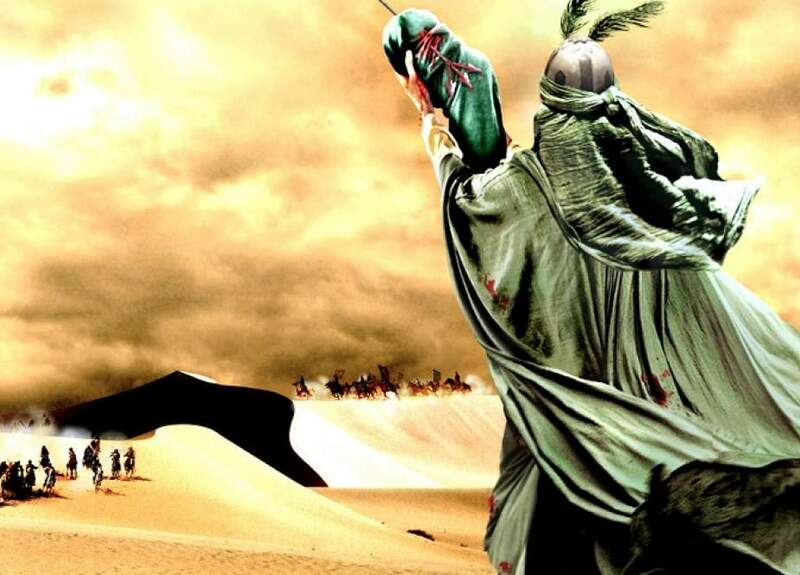 Cut out from water and standing before an army of 30 thousand according to narrations attributed to Imam Ali bin Hussein by Sheikh Sadduq led by Ubaydullah ibn Ziyad, Imam Hussein knew his destiny and his was ready to face it. Yazid instructed Umar bin Saad, head of the Kufan army, to give Imam Hussein and his supporters the option to swear allegiance to Yazid and cut off access to water from the Euphrates at the same time. Thirsty but uncompromising, Imam Hussein and his companions put up a fierce fight. The battle of Karbala lasted for half a day on Muharram 10, 61 AH (10 October 680 AD), leading to martyrdom of Imam Hussein, his brothers, sons, nephews, and loyal companions for one cause: the continuation of the religion of Prophet Muhammad, Islam. It was a bloody and unrelenting massacre. But the Umayyad army did not stop there. The troops even looted the tents, held the women captive including Imam Hussein’s sister Sayeda Zeinab, and tried to kill Imam Zein Abidine who was ill at the time and became the fourth Imam after his father was slain. The killings at Karbala fueled the later Shiite movements. Anger at Imam Hussein’s martyrdom was turned in to a rallying cry that helped undermine and ultimately overthrow the Umayyad Caliphate.